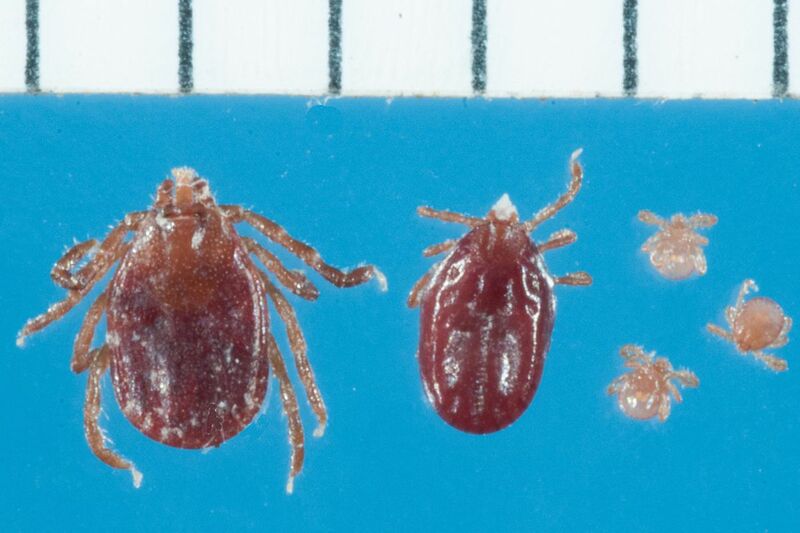 The longhorned tick, Haemaphysalis longicornis Nuemannat larval, nymph and adult stages. Hash marks denote scale in millimeters. Add the longhorned tick to the growing list of invasive species farmers, foresters and officials are confronting. The Rutgers Center for Vector Biology published a study last week confirming an infestation by Haemaphysalis longicornis at one farm in Hunterdon County, N.J. Previously, the tick wasn't known to have made it into the U.S., though animals carrying the tick have been stopped at borders. The longhorned tick, which originates in East Asia, was first discovered in New Jersey in November. The arachnid was found on a 12-year-old Icelandic sheep on the farm, in the northwestern part of the state. Rutgers worked with Monmouth and Hunterdon counties to examine how many of the ticks there were, using DNA analysis to identify them. They found a large number of the critters, in all life stages, on both the sheep and its paddock. The sheep had never been outside the U.S. so how the tick got there is unknown. The sheep has has since died, most likely from an unrelated cause. Scientists are concerned whether the infestation survived the winter, said Dina M. Fonseca, a professor and director of the center at Rutgers. Results might not be known until May so it remains unclear whether the tick has established a permanent presence. Rutgers' scientists do not believe climate change provided a path for the pest to New Jersey. However, they note its survival in the U.S. could be affected by increasingly warm temperatures. The tick adds to the number of destructive invasive species from Asia that New Jersey and Pennsylvania are already dealing with, including the spotted lanternfly, southern pine beetle, and hemlock woolly adelgid, among others. The longhorn tick, also known as the bush tick, poses a threat to livestock such as cattle, horses, goats and sheep. It is a major problem in New Zealand and transmits a disease in animals called Theileriosis that leads to anemia and sometimes death. The impact on humans is less clear. In other parts of the world, the tick has been associated with diseases that are found rarely in people, such as spotted fever rickettsiosis. Andrea M. Egizi, the senior author of the tick study, said scientists need more information before they can assess whether the new tick poses a threat to local residents. She said the tick transmits human pathogens in its native range in Asia, but only on occasion and usually affects those that are in contact with livestock. Those pathogens are not normally present on U.S. soil. The question, she said, is whether the longhorned tick can transmit pathogens native in the U.S.
"So the potential for human health impact is unknown at this point," Egizi said. "What we do know is that it can definitely be a problem for livestock." The species is dark brown and grows to about the size of a pea when engorged on the blood of its hosts. Nymphs emerge in spring but are hard to spot with the naked eye. They become adults in the summer. Officials say have treated the New Jersey property and animals where the tick was found. However, the N.J. Division of Fish and Wildlife and Department of Environmental Protection are watching to see if the tick has spread. Farmers are encouraged to monitor livestock for anemia.